Federal prosecutors sued New York City on Thursday, alleging that the city has not sufficiently moved to reform the city’s notorious Rikers Island jail, where “force is used against adolescents at an alarming rate,” according to the US Justice Department. 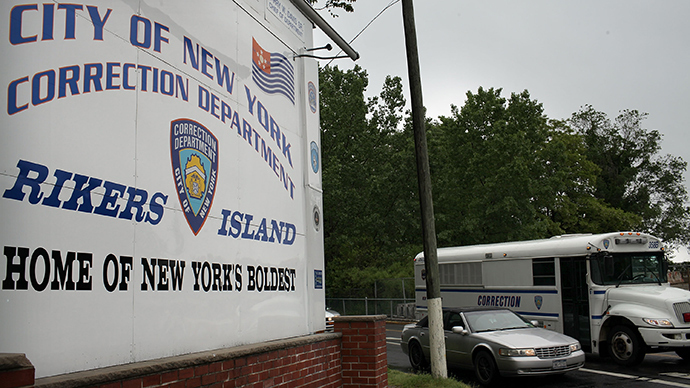 In August, the Justice Department released a graphic 79-page report, which found a “deep-seated culture of violence” aimed at young offenders held at Rikers Island. The report, the result of a two-and-a-half-year investigation on conditions at jail facilities between 2011 and 2013, detailed, among other damning findings, the wanton use of solitary confinement imposed on youth. While New York City Mayor Bill de Blasio announced just Wednesday the end of solitary confinement for 16- and 17-year-old inmates, the move addressed just one of the 73 recommendations made by federal prosecutors to slow the violence while boosting investigation integrity and accountability. US Attorney General Eric Holder and Manhattan US Attorney Preet Bharara wrote in court filings that four months of negotiations with city officials have failed to lead to an “agreement as to lasting, verifiable, and enforceable reforms." The lawsuit described a violent environment in which jail guards provoke inmate fights, beat inmates while yelling “stop resisting,” pressure inmates to avoid reporting beatings, and fail to adequately investigate incident reports. Jail officials have been "deliberately indifferent to harm" of young inmates by failing to report abuse, falling short on staffing measures, and failing to discipline abusive officers, the suit added. "To date, defendants have failed to take sufficient and effective measures to remedy these deficiencies," the suit said. The suit asked for a judge to issue a consent decree to demand reforms occur. The city has agreed to such action, according to the suit, as reported by AP. Neither the mayor’s office nor city attorneys answered AP’s requests for comment. De Blasio and city corrections commissioner Joseph Ponte have touted some recent improvements to the nation’s second-largest jail system, including a cap - 30 days, down from 90 days - on solitary stays, a more equitable staff-to-inmate ratio, and funding for increased surveillance video capabilities over the next two years. But federal prosecutors said these reforms have yet to reach 18-year-old inmates, noting that there have been 71 reported incidents of force used against 18-year-olds between September and November in Rikers facilities without surveillance cameras. As of last month, at least 40 of those inmates were being kept in solitary confinement. The August report on the 11,000-inmate jail system found that about 44 percent of male inmates aged 16 to 18 in custody as of October 2012 had been subjected to some level of physical violence by corrections officers on at least one occasion. This month, a correctional guard at the Rikers Island was arrested over the death of a homeless former Marine who was left inside a 101-degree jail cell earlier this year. The guard faces multiple counts of falsifying records and misconduct. Prior to the arrest, Mayor De Blasio introduced new measures to try and avoid sending mentally ill people to Riker’s Island after similar accounts of abuse.